The naturalization process is the path through which a foreign citizen or national can voluntarily become a U.S. citizen. In order to begin the naturalization process, an applicant must first meet several requirements. Then, he or she must file an application for naturalization, attend an interview, and pass an English and a civics test. Nearly 287,000 permanent residents filed an application to naturalize in the first three months of 2017. 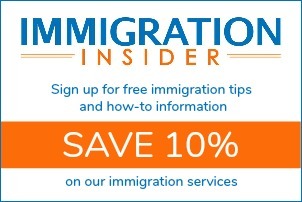 According to USCIS – the U.S. Citizenship and Immigration Services — that’s up almost 15% from the previous year. Before you begin the naturalization process, you’ll need to check your eligibility to become a U.S. citizen. If you’re a lawful permanent resident (green card holder) who has lived in the United States for the past five years, you’ve passed the biggest hurdle. 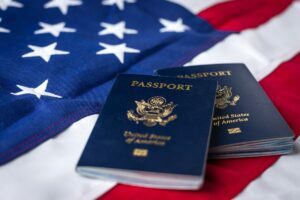 Although there is an exception for permanent residents who have been married to a U.S. citizen for the past three years and military personnel, most people become eligible for the naturalization process after five years of continuous residence. For a more detailed explanation of these criteria, read U.S. Citizenship Requirements for 5-Year Permanent Resident. Or if you’re ready to dive in, start our naturalization eligibility quiz. A permanent resident who wants to become a U.S. citizen must prepare and file Form N-400, Application for Naturalization, with USCIS. The 20-page application should be carefully filled out. USCIS will use the application to review your history as a permanent resident. Be thorough and make sure your answers are consistent with your supporting documentation. Discrepancies and inconsistencies can cause confusion, delays and even the suspicion of fraud. At the time of writing this article, the total USCIS fee for naturalization (for most applicants) is $725. It’s a one-time fee, and you won’t have to pay anymore USCIS fees in the future. If you remain a permanent resident, you’ll be required to renew your green card every 10 years. That adds up quickly. It may surprise you. See the Citizenship Cost Calculator. Permanent residents with a criminal record or blemished immigration history should always consult with an immigration attorney before filing any USCIS form. But most people can prepare Form N-400 without the assistance of an attorney. Those that want some extra reassurance that they’re doing everything correctly can use CitizenPath.com. Immigration attorneys designed CitizenPath’s online preparation software to make the process easier and help eliminate many of the common mistakes that cause delays and rejections. The process of naturalization officially begins when you mail in your Form N-400. 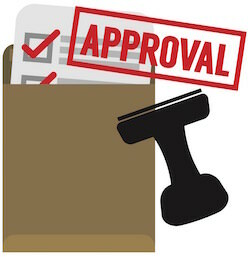 USCIS will initially review the application to ensure it is complete. If you do not completely fill out the N-400 application, you will not establish a basis for your eligibility and USCIS may reject or deny the application. 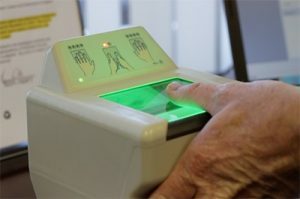 Shortly thereafter, USCIS will automatically schedule you for a biometrics appointment. USCIS employees at the application support center will collect a photograph, fingerprints, signature and other details. USCIS will utilize this information for an FBI criminal background check. The biometrics screening is a short, 20-30 minute appointment. However, poor preparation can delay your case. Avoid rescheduling the appointment unless absolutely necessary. Take all items listed on the appointment notice. Generally, you’ll need to take the appointment notice (Form I-797C), your green card and another form of identification (driver’s license, passport, or state ID). One of the best ways to prepare for this interview is to simply review your Form N-400. The USCIS office will most likely ask questions about the application. Since it will have been a few months since you filled out the application, take some time to review your answers before the interview. Your ability to answer the interview questions will be a component of your English test. In all, the officer will test your ability to read, write and speak English (unless you are exempt). To test your ability to read in English, you must read one sentence, out of three sentences, in a manner suggesting to the USCIS officer that you understand the meaning of the sentence. Likewise, to test your ability to write in English, you must write one sentence, out of three sentences, in a manner that would be understandable as written to the USCIS officer. Learn more about the English test portion of the naturalization process. The USCIS officer will also give you a civics test in English to test your knowledge and understanding of U.S. history and government. The officer will ask you to answer a set of civics questions. To pass the test, you must correctly answer six out of 10 civics questions. The good news is that all of the questions are available to study! USCIS selects your questions from a set of 100 possible questions. Learn more about the civics test and get the study questions. In most cases the USCIS officer will let you know how you did. If you passed, the officer will generally let you know that he or she is recommending that you be granted U.S. citizenship. You’ll receive official notification in the mail and an invitation to attend an oath ceremony. 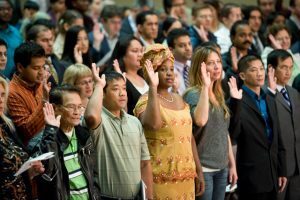 If USCIS approves your Form N-400, Application for Naturalization, you will be required to attend a ceremony and take the Oath of Allegiance. In fact, you are not a U.S. citizen until you take the oath. You’ll also need to surrender your green card at the oath ceremony. Once you have recited the oath, USCIS will issue you a Certificate of Naturalization. The certificate is proof of your U.S. citizenship and can be used to obtain a U.S. passport. Update your citizenship status in your Social Security record. Find the nearest SSA office by calling 1-800-772-1213 or at www.socialsecurity.gov. The time line for the naturalization process is approximately five to eight months, depending on USCIS workload and your particular case. One of the best ways to ensure a short processing time is to carefully prepare your application, making sure that you prepare Form N-400 correctly and file it with USCIS according to the instructions.